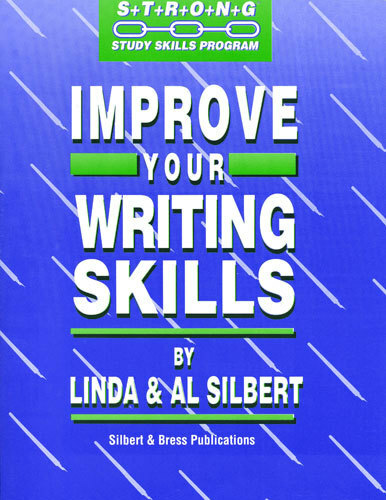 Improve Your Writing Skills, one of five interactive study skills workbooks by Linda Silbert, PhD and Al Silbert, EdD, shows your teens how to write easily and effectively. With an easy-to-follow, step-by-step approach, it's the perfect antidote to writer's block. Good writing skills make a big difference in tests that require essay or short paragraph answers. Sometimes even science tests ask for a paragraph or sentence. Improve Your Writing Skills helps with any writing assignment and any test requiring writing in any subject. Teachers and parents teaching and helping kids how to write love this interactive "how-to" book. Topics include how to get started, how to write sentences that flow, how to organize your thoughts, and how to finish. When kids complete the exercises, they'll have an excellent finished school paper. Use this highly effective resource for students with learning disabilities such as ADHD, sensory processing disorder, language processing disorders, dysgraphia, and dyslexia. Middle school and high teachers, special ed teachers, parents, and tutors will find Improve Your Writing Skills a powerful little book to use with their kids. The learning strategies make writing easy. Pick up a copy of "Improve Your Writing Skills" Today. Help your teenager with writing and improve test scores.